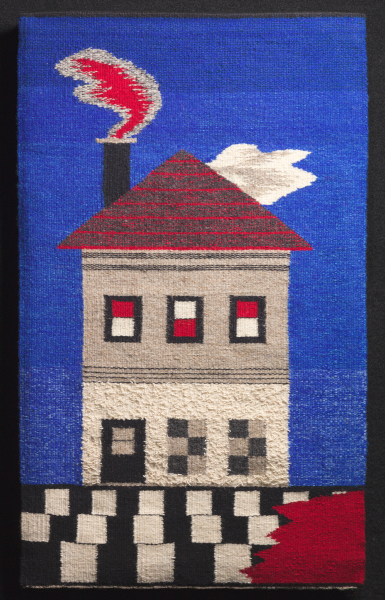 Louise Halsey will have a piece of her work in our upcoming tapestry show (opening May 3rd) and it is part of a series that she has done about houses under duress. She had a joint exhibition with a friend who was creating paintings using collage with playing cards for the houses. http://www.arktimes.com/RockCandy/archives/2011/10/19/louise-halseysusan-chambers /. You can check out this as well as the use of the term “solastalgia” which was the title for the show. In 2012 Louise was one of 5 artists chosen by the Arkansas Committee for the National Museum of Women in the Arts http://acnmwa.org/events-exhibits/ to submit to be in an exhibition with a focus on the fiber arts which would take place at the museum in Washington DC. Of the 5 fiber artists (in a variety of media including quilting, stitching, printing) her work was selected for the exhibition http://nmwa.org/exhibitions/high-fiber. After the work returned, all 5 artists had their work in an exhibition that toured around Arkansas for a year. The opening for the exhibition in Washington DC was planned to be when the representatives from the state committees met for their annual meeting. Arkansas has a very active group (started by Helen Walton, Alice Walton’s mother). It was going to be a very exciting time for Louise with many from Arkansas in attendance. On the weekend before she was to arrive for the Thursday opening, Hurricane Sandy started to become a factor. On Saturday she actually drove to the airport in Little Rock ( over 2 hours away) to see if she could get an earlier reservation as all flights had already been cancelled starting on Monday (when she was to fly). On Sun. morning she waited for the airline reservation counter to open. When it did, she had to convince those there that she could not fly on Monday (they did not yet know this!). She was put on a flight immediately, arrived in DC, took the metro to a friend’s apartment and settled down for Hurricane Sandy to arrive. Washington DC and most of the East Coast were shut down on Monday. None of the others from Arkansas made the trip. No friends from beyond Washington were able to attend. The hurricane did not do much damage in Washington. Several of the artists in the exhibition were installing on Thurs. before the opening, all managed to get there for that. It was a small reception, but given the situation it was really a miracle that it happened on time and all artists and her husband were present. After that experience, Louise decided to do a tapestry about Hurricane Sandy,she looked at some images from the storm and decided to do a house that had been shoved off its foundation, moved nearer to the shore and was sitting there now on a bright sunny day after the storm had passed. This will be on exhibit. Louise weaves on a floor loom, using linen for the warp, mostly wool for the weft. She uses commercially dyed yarns with a few exceptions. Please visit her website and better yet come to see here work during our opening or throughout the months of May and June.